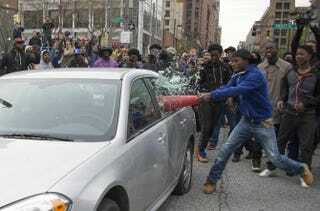 Demonstrator identified as Allen Bullock uses a traffic cone to break the window of a police car in Baltimore April 25, 2015, during protests of the death of Freddie Gray. Allen Bullock, the 18-year-old seen in photos smashing in a police car with a traffic cone, turned himself in after being encouraged by his parents. But now he is being held on $500,000 bail, an amount his parents cannot afford, The Guardian reports. Bullock faces charges of rioting and malicious destruction of property, among other criminal counts, after turning himself in at the Baltimore City Juvenile Justice Center with his stepfather, Maurice Hawkins, at his side. According to Hawkins, who saw footage of his stepson on Saturday, the teen agreed to turn himself in after his stepfather told him that the police would “find him, knock down our door and beat him” if he didn’t, The Guardian notes. Hawkins noted that the proposed amount is higher than that placed on some accused murderers in the city. “Who could afford to pay that?” the stepfather asked. “If they let him go, he could at least save some money and pay them back for the damage he did,” his mother agreed. The eight misdemeanor charges Bullock face are his first as an adult, with rioting carrying a maximum of life in prison. The Guardian, however, says that his parents believe that four to eight years is a more likely sentence. Bullock, who was convicted of minor offenses as a juvenile, was working in city sanitation under a program for people in juvenile probation, The Guardian notes, earning more than $15,000 a year. His parents say that the teen was accused of inciting the clashes that started boiling over on Saturday, but they deny that claim. His mother didn’t feel the same way. “I do,” she said.